Not trying to boast, but......! We are extremely honoured to announce that we have won the award of Supreme Winner in the Rankers Traveller, this now makes it three times in a row! We’ve also been awarded a Certificate of Excellence by Trip Advisor – thank you so much for all your reviews and comments! On a mobile or tablet? Click here to post a review! On a mobile or tablet? Click here to read our reviews! Qualmark New Zealand Limited is New Zealand tourism’s official quality agency. It is a government – private sector partnership between Tourism New Zealand and New Zealand Automobile Association. Qualmark licenses professional and trustworthy New Zealand tourism businesses to use the Qualmark® – tourism’s official quality mark – to help international and domestic travellers select places to stay, things to do and ways to get around. 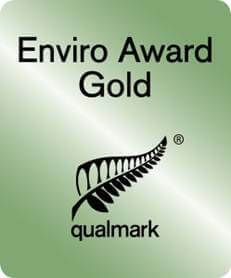 Jacksons Retreat has obtained a 5 star Qualmark rating and Environmental Gold Award. Our Unique Covered Camping Barns won an Innovation Award! Do you have a comment about our park, facilities or services? We’d love to hear from you! You can post your comment or review here. We aim to provide a relaxing environment where you can unwind in a natural environment, but also offering plenty to do and see to keep you - and the kids! - entertained!